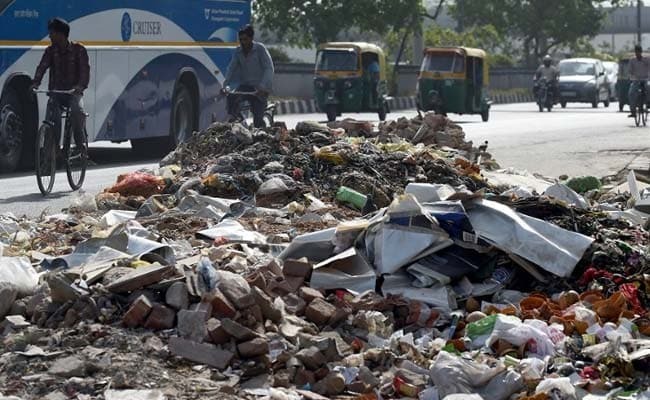 New Delhi: For east Delhi residents, this Diwali season would mean a stench-filled air, as scores of municipal sanitation workers today went on an indefinite strike over various issues, including over not getting salaries. Authorities of the cash-strapped East Delhi Municipal Corporation or EDMC sought to pacify the agitating workers, but did not succeed. "We were called by the EDMC authorities, and we met the mayor and the municipal commissioner. The commissioner told us the corporation is facing a financial crunch. So we will continue to protest," said Sanjay Gehlot, head of the sanitation workers' union. He said the union has some 11,000 members, and most of them have joined the protest. This could mean east Delhi is staring at a garbage-cleaning crisis. Patparganj, Mayur Vihar and Gandhi Nagar are some of the most densely populated areas of Delhi and several unauthorised colonies are also located there. "Our demands include payment of salaries due to various employees, arrears and medical cashless card, retirement benefits and pension," Mr Gehlot said. "Tomorrow, we will burn the effigy of mayor Neema Bhagat and throw garbage in front of her house." Yesterday, the EDMC had said that the mayor met with members of some unions and assured them that all their "legitimate demands would be met". "Safai karamcharis are the backbone of the EDMC and the corporation would make all possible efforts to fulfil their demands, including the one about issuing a cashless card," she had said yesterday.